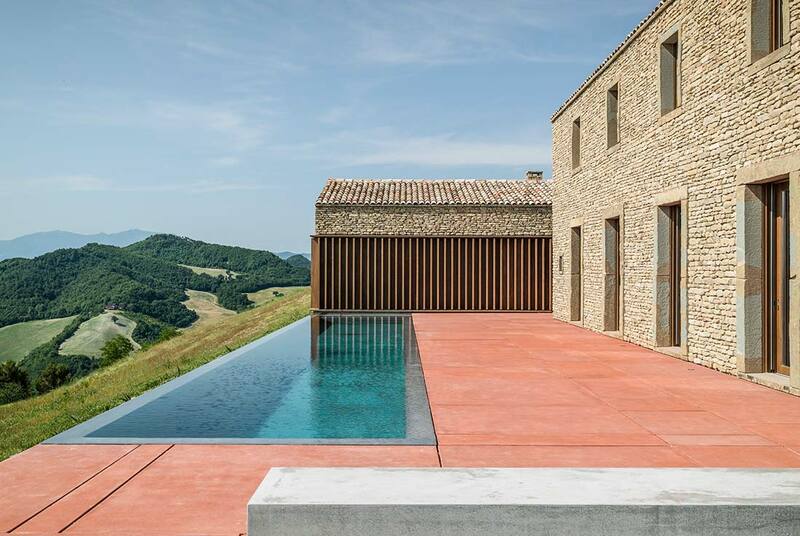 of the highest hills in Urbino, highly esteemed for its landscape and environment. The new system of buildings stands on ancient remains dating back to Medieval Communes. dominating the surrounding landscape. 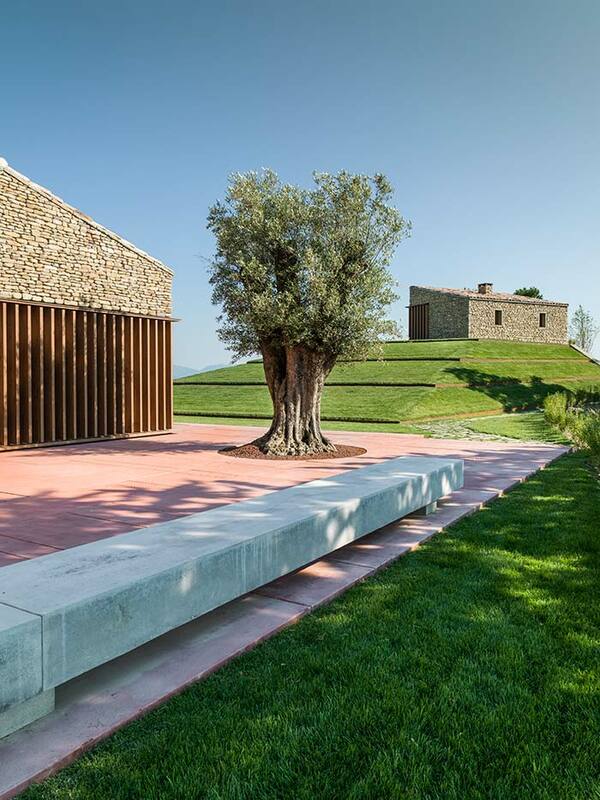 The core of the houses, which forms a single housing unit, reestablishes a central role to this site in the landscape, restoring a direct and empathic dialogue between new buildings and historical stratification. 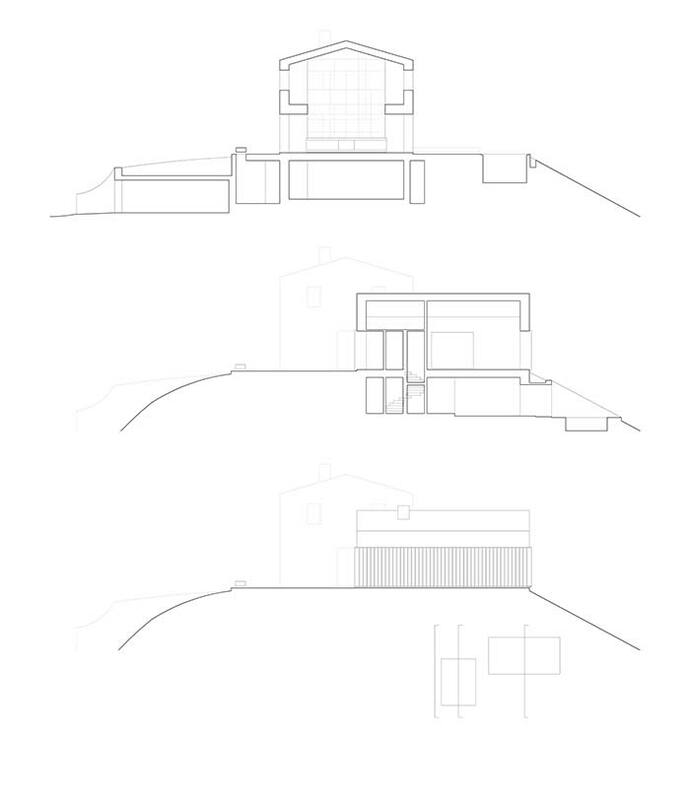 The structures, in their stone shell, free from any superfetations such as gutters or drainpipes and in their measured proportions, are offered to the landscape as pure, discreet and silent artifacts recovering their identity and affinity with the rural cultural matrix of the place. 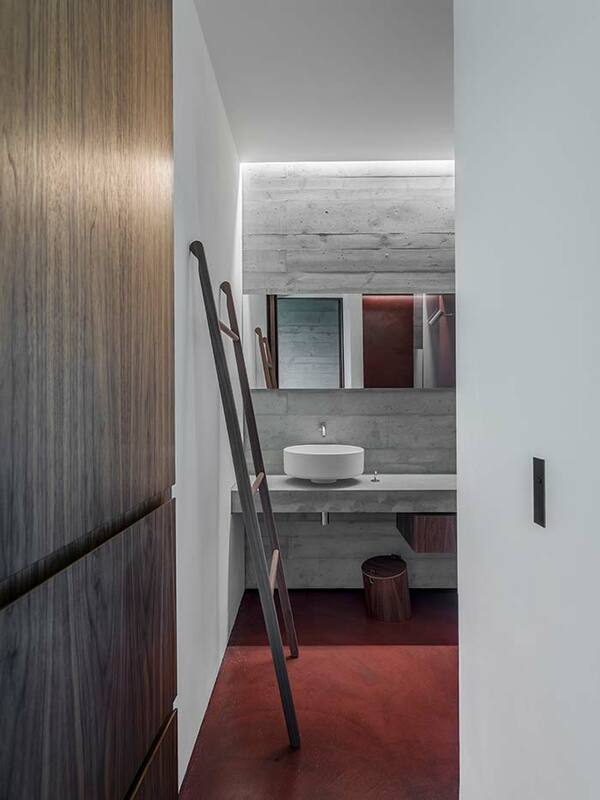 If the project with its architectural compositions and rigor, faithfully interprets the typical formal themes of this Italian region (Marche), in its interiors, in the treatment of the materials, the design of the plant and its furnishings, it wants to vindicate its remarkable contemporaneity. 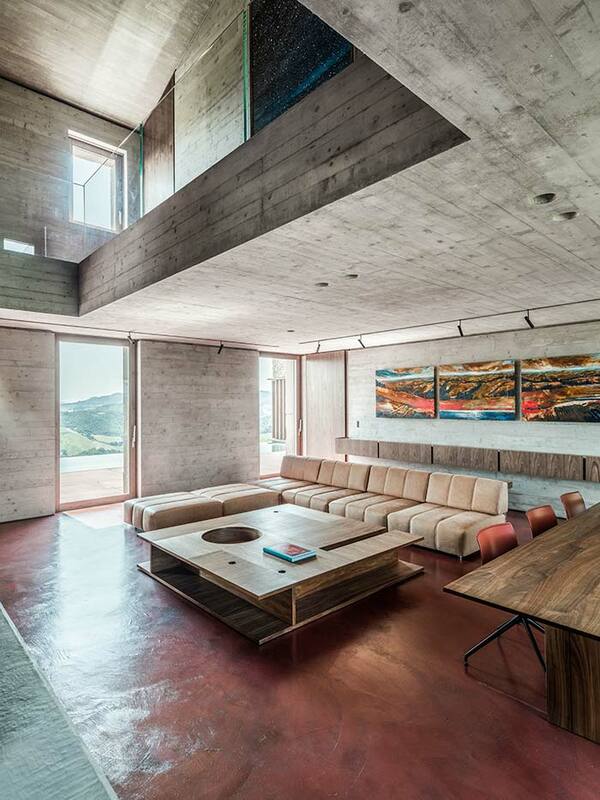 The fair-face reinforced concrete structure of the internal perimeter, creates space for natural light to flood in and releases the volume from any other load-bearing element. The full functional program is arranged on three levels. the main entrance is located in the large garage in the basement. On the lower level, besides the technical and plant areas, there are all the main facilities: a cinema room, an exhibition gallery in the connecting space between the main building and its annex and a gym with an adjoining SPA. 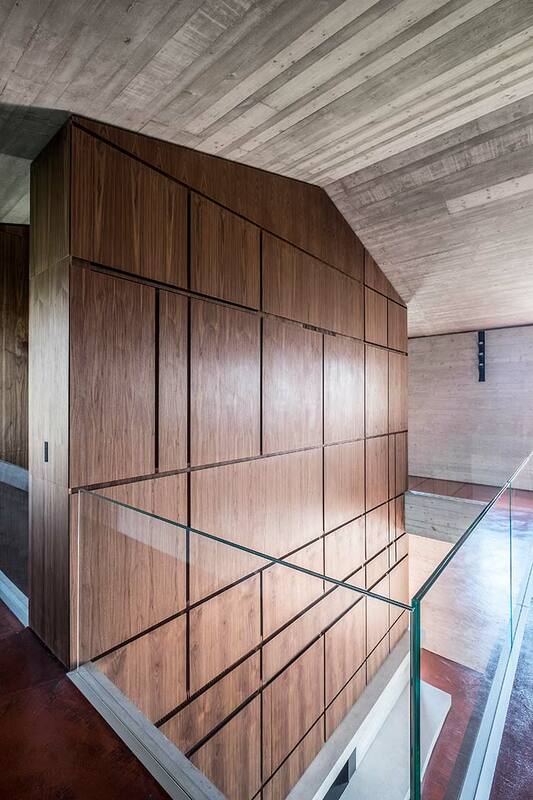 From the basement, the staircase leads directly to the heart of the main building where the view opens up over the stunning hilly landscape and the swimming pool area. 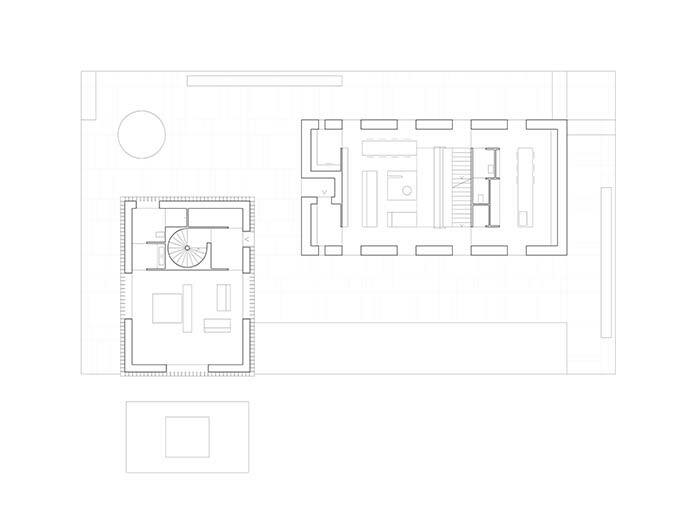 This is the living room, dining room, kitchen and private studio space. On the first floor, arranged around a large balustraded landing, is the master apartment and two double bedrooms with thier suite restrooms. qualifies and creates order in each room concealing service areas and plant and technology components. The annex, with its wooden frame structure, is a barn memory which is often a constant presence in this scenery. A third building is located in the garden upon a little artificial hill. In its basement there is a storage room for the gardening equipment and a barbecue on the ground floor. This part of the garden, with its disaligned geometry made of Corten steps and grass, wants to slightly break away from the severeness of the whole outdoor composition. The energy supply, which is only electrical, is guaranteed by an extensive photovoltaic system hidden in the grounds of the property and located at a distance from the buildings .